Born in Oklahoma City, Oklahoma in 1951, Tom Fallwell had always had a love of fantasy Role Playing games and was a game master who created adventures for other players to enjoy. Now, since retiring as a computer programmer, he is writing the fantasy stories he had always wanted to write and enjoying every minute of it. Shortly after retiring, in 2014, I met a friend who immediately saw my love of creating stories and recognized my talent. Through her encouragement, I wrote a short story, a sort of Christian/Fantasy/Romance. It was well received by those who read it, and this encouraged me even further. I had a story in my head that I had only thought of a beginning for, with a simplified plot that I had in mind. I decided, why not? So I sat down and started to write. The story took on a life of its own and within six months I had a novel. The whole experience was so much fun, I never stopped. I kept writing, and I’m still writing. I only have one place. Sitting at my computer. I use Microsoft Word and do all my writing at my desk, which is in my bedroom. I have no wife or children in the house, so I find plenty of solitude. I have a 42” flat screen TV as my computer monitor and a custom built quad-core computer running Windows 10. I may slosh stories around in my head all the time, but my desk is my only place to write. I don’t play music or have other distractions when writing. Not specifically. In general, I have an idea and I form a rough outline of the plot, then I start writing. Almost inevitably, that plot changes as I write. I am not sure how to explain with words, but it is as if the story tells itself. I start down a path, then the story and characters take on a life of their own, and before long I feel like I am just writing what I am told to write by the characters and the story itself. I have always been fascinated by the world that J.R.R. Tolkien created with his stories of Middle Earth. It is my greatest desire to create a world with the same rich lore and history, a world that is fascinating to the reader as much as the characters, and to create characters who come to life in the reader’s mind, just as Bilbo, Frodo, Gandalf and others. Tolkien is my hero. I aspire to be as well-read and remembered as he is. What inspired you to write the Rangers of Laerean series? Back in the late 1980s was a phenomenon called the Black & White Comic Boom. There was an explosion of writers, artists and publishers to get comics on the shelves, and many made it to comic stardom. Teenage Mutant Ninja Turtles for example, became an overnight success and has now been two live action movies, at least. Back during that time, my brother, David, and I created a Black & White Comic called Dark Regions, which was a fantasy story that I was involved in writing. We created a trio of characters that I have known intimately for many, many years. One of those characters, Baric, I had always considered a Ranger, sort of like Aragorn in Lord of the Rings, though not exactly the same. After writing my first novel, I knew I wanted to create a world like Tolkien. I wanted to create the whole things, politics, economy, races, all of it. I wanted to create a series of novels based on this world, and it just seemed logical to include Baric. So, the idea for the Rangers was born. Also, I loved heroic fantasy stories, again like what Tolkien did, so I created a group of heroes as the Rangers to be able to keep telling stories about this world. Not just about Baric, but about others as well. So, Rangers of Laerean was born and the Lands of Hir were created. 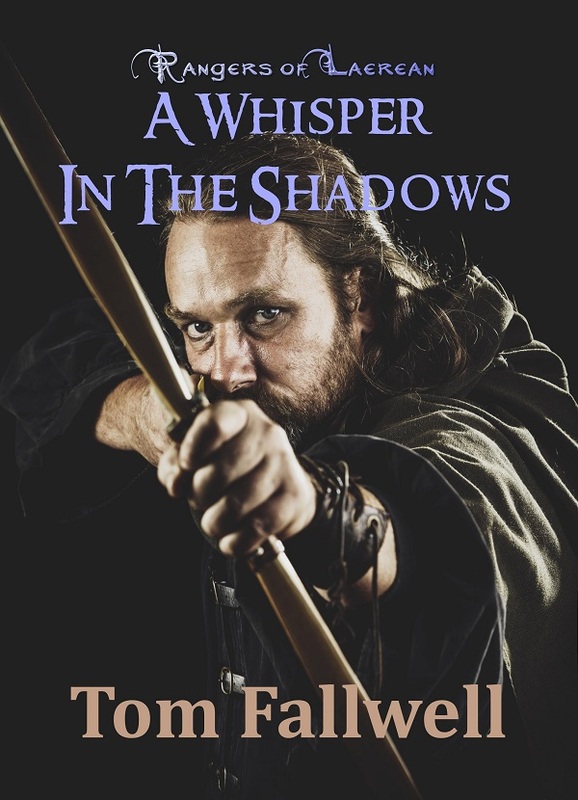 The first book, A Whisper In The Shadows, is an introduction to the Rangers and to Baric in particular. Baric agrees to help what is supposed to be an emissary from the region called Vaar’da, where a dark-skinned, elf-like race dwells. But Baric soon discovers that the emissary, and exotic female who deems humans as barbaric, is not an emissary after all, and she has used deception to get a Ranger at her side for an entirely different reason. The Vaar’da, Whisper, is an assassin, but she is having nightmares that are tearing her soul apart and she is seeking help to journey to a place her drams seem to be pulling her. What she and Baric discover is something that neither expect, and they soon find themselves on a quest to save the entire world of Hir. Baric gathers a small army of fellow Rangers to assist them as they delve into the depths of an active volcano, Mt. Scorch, to prevent the destruction of all of Hir.Upon writing this book, it became apparent that this story was going to require more than one book to tell, so it has become a trilogy. 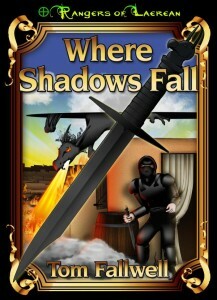 Book #3, Where Shadows Fall, was released in February and is now available. I am currently writing book #3, The Shadow of Narwyrm. This trilogy tells one story, and I have many more in mind for the series as a whole. Future novels will cover different times, different places and characters. Currently, I have to say Baric is definitely my favourite. That may change in the future. Who knows? I have created many characters on this journey, and I expect I will be creating many more. My main goal is to entertain, though I have no doubt I subconsciously do have messages in my writing. Upon reading the finished first book, I could definitely see a theme about prejudice that became quite apparent. But I don’t consciously try to instil messages. As his torch lit up the interior of the cell, he saw that last thing he could have expected. Inside the cell, chained to the wall, standing upright, was a fur-covered figure, as big as himself, with a lion-like face and ears, and a long, flowing mane. A Zumarian. The Zumarian’s eyes were closed, and he appeared to be unconscious. He wore a loincloth, but his chest, arms and legs were covered in soft, golden fur, fading to white around his chest. His leonine face bore a human-like nose and cat-like mouth, with a slight hair-lip appearance. The claws on his hands and feet looked formidable. His long mane flowed down around his shoulders, golden brown with braids on the sides that held the fringe back and out of his face. As they eyed him, his eyes suddenly popped open, showing sea-green irises around an overly large, black pupil. His mouth formed into an angry expression when he saw Whisper. “The gods are cruel indeed if they send a Vaar’da as my rescuer,” he snarled. His voice was guttural, but understandable. Almost instinctively, Whisper immediately assumed the air of self-importance that she had once displayed for Baric and other humans. “I would just as soon finish what someone else has started,” she hissed. “Wouldn’t it be to the benefit of us all to concentrate our fury on the Manenase instead of each other?” Baric asked in a determined tone. The Zumarian and Whisper both looked at Baric with surprise, as if they both had forgotten he was there. Whisper nodded, her gaze still focused on the Zumarian. “Who are you?” asked the Zumarian. The Zumarian suddenly grinned, showing a mouthful of sharp, pointed teeth. The grin could easily be mistaken as menacing, if not for the obvious delight conveyed by his eyes. “Can I assume you won’t attack my companion?” asked Baric. Shaha chuckled, a growling sound, but definitely a sign of amusement. “You have my word,” he said. Whisper snorted and rolled her eyes, but she said nothing more. Producing some lock-picks from her robe, she went to work on the cell door. After about a minute, the lock clicked and the door swung inward. “Can you get the shackles?” asked Baric. “Of course,” she huffed, acting more like the Vaar’da Baric had first met back in Ronan’s office those many months ago. “Do you have weapons or armor anywhere?” Baric asked as Whisper began to work on Shaha’s shackles. The shackle around one of Shaha’s hands clicked open. He held it up and flexed his claws a few times, trying to restore the blood flow. “I can use these for now,” he grinned. Baric nodded. The claws were at least an inch long and looked razor-sharp. Another click, and Shaha was free. Whisper stepped back, returning her picks to their pocket inside her robe. “Remember who freed you, Zumarian,” she said with no small amount of contempt. Shaha just grinned, baring his teeth. What would say has been your biggest challenge and achievement in writing the Rangers of Laerean series? With this first story as a trilogy, I think my greatest challenge has been to tell the story so that a reader does not have to read the previous books in order to enjoy the current one. I try to give enough information about what has transpired, without becoming a boring documentary about the past. So, that has been a challenge for me. To make each book able to be read as a stand-along novel, but still have all three tied in as a trilogy. What have you learned about yourself as a writer through writing the Rangers of Laerean? I’ve learned a lot more than I could relate here. It has been a fantastic learning experience. I’ve learned about the whole writing and publishing process, about the roles of copy editors, cover artists, formatting, and on and on. What I really learned about myself is that, I can’t do it alone. A good novel takes more than one person. I may do the writing, but to be a good book, it needs a whole lot more. There are many people writing and publishing out there. If you want this to be something you can enjoy, then you need to take your mind off fame and riches. If your stories are good, and people like them, then word will get around. You have to promote, sure, but what I learned was to concentrate on writing what I wanted to write, and writing to please my own sense of style, not to try and become someone else. True, I love Tolkien, but I know I am not him, and I don’t want to be him. I want to be me, and if I am to become known as a good author, I want it to be because of what I wrote and enjoyed writing. It’s been a lot more fun that way. Just thank you for the opportunity to answer your questions. I always enjoy interviews and meeting others. I ‘ve made many new friends since I started writing and I look forward to meeting many more in the future. It is always a pleasure for someone to tell me they enjoyed on of my books. As I noted earlier, I am currently working on book #3 of the Rangers of Laerean series, The Shadow of Narwyrm. I am also currently working on a science-fiction short story that I hope to enter into a contest. As well, I have more stories in mind for the series and other books in general. I have plans for much more. I’m still having too much fun.